Bosentan is well known to induce cholestatic liver toxicity in humans. The present study was set up to characterize the hepatotoxic effects of this drug at the transcriptomic, proteomic, and metabolomic levels. For this purpose, human hepatoma-derived HepaRG cells were exposed to a number of concentrations of bosentan during different periods of time. Bosentan was found to functionally and transcriptionally suppress the bile salt export pump as well as to alter bile acid levels. 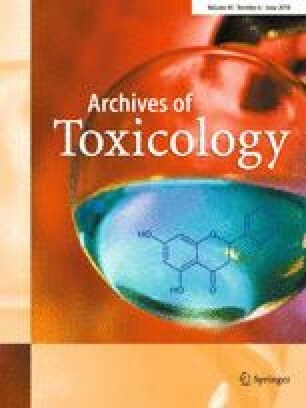 Pathway analysis of both transcriptomics and proteomics data identified cholestasis as a major toxicological event. Transcriptomics results further showed several gene changes related to the activation of the nuclear farnesoid X receptor. Induction of oxidative stress and inflammation were also observed. Metabolomics analysis indicated changes in the abundance of specific endogenous metabolites related to mitochondrial impairment. The outcome of this study may assist in the further optimization of adverse outcome pathway constructs that mechanistically describe the processes involved in cholestatic liver injury. Bosentan BSEP HepaRG Cholestasis Transcriptomics Proteomics Metabolomics Adverse outcome pathway. The online version of this article ( https://doi.org/10.1007/s00204-018-2214-z) contains supplementary material, which is available to authorized users. This work was financially supported by the grants of European Union (FP7)/Cosmetics Europe (SEURAT-1 projects DETECTIVE (HEALTH-F5-2010-266838) and HeMiBio (HEALTH-F5-2010-266777)), the European Research Council (Starting Grant 335476), the Fund for Scientific Research-Flanders (FWO grants G009514N, G010214N, G012318N, G020018N and 12H2216N), the University Hospital of the Vrije Universiteit Brussel-Belgium (“Willy Gepts Fonds” UZ-VUB) and the Center for Alternatives to Animal Testing (CAAT) at Johns Hopkins University Baltimore-USA. The authors also gratefully acknowledge the financial support from the Ministerium für Innovation, Wissenschaft und Forschung des Landes Nordrhein-Westfalen, Senatsverwaltung für Wirtschaft, Technologie und Forschung des Landes Berlin, and the Bundesministerium für Bildung und Forschung. The authors like to thank Dr. Christophe Chesné (Biopredic) for making HepaRG cells available, Dr. Stefan Vinckier for assistance with confocal microscopy and Miss Tineke Vanhalewyn for technical assistance.